Sommer’s wine journey started in the mid 1950’s after graduating in horticulture from the University of California-Davis. He was the first of many modern day dreamers convinced that Oregon was the “promised land” for fine wines. In 1961 Sommer purchased 35 acres near Roseburg in the Umpqua Valley and planted a small vineyard. In 1963 he bonded (#44) Hillcrest Vineyard, Oregon’s first commercial vinifera winery. Riesling was his signature grape variety. Sommers planted the first Pinot Noir in 1961 with cuttings brought into Oregon in 1959. He was also the first winery to produce Pinot Noir wine in 1967. It is also notable that in 1968 Hillcrest released this wine for commercial sale in grocery stores. This marked the first time that consumers could purchase Oregon Pinot Noir in a super market. Sommer became the roadmap for others to follow in growing grapes and making wine in Oregon’s cool climate. He had a long career as an industry pioneer, and was an inspiration to many Oregon vintners. In 2003 Dyson and Susan DeMara bought Hillcrest and operate the winery at 240 Vineyard Lane, Roseburg, Oregon. 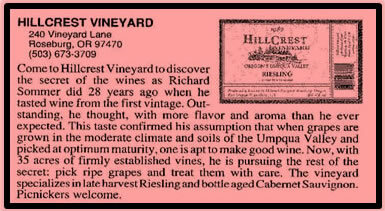 In 1963, Richard Sommer bonded (#44) Hillcrest Vineyard, Oregon’s first commercial vinifera winery.